Early this month, Kila Doll dropped by with some of her masks for me! 'Kila' means pretty and shiny in Japanese and this is exactly what Kila Doll wants for all ladies! Kila Doll's masks are designed specially by a group of professional R&D group to suit our Asian skins. Made with 100% Japan-imported silk wood pulp fiber, the entire mask and its ingredients are manufactured and formulated in Taiwan. The masks are made to fit our smaller Asian faces perfectly. With its silk wood pulp formula and the absence of non-woven wool fibers, the masks adheres to our skin strongly and the risk of skin allergies is reduced. The masks are also breathable and this means that the essences are able to penetrate our skin layers deeper. Kila Doll aims to provide skincare with superior quality and yet, keep it affordable. She makes sure that her masks are gentle enough for daily usage so that we can achieve fairer, more hydrated and healthier-looking skin ASAP! 1. Hyaluronic Acid Mask: Intensive moisturizing and brightening, improves skin's elasticity. 2. 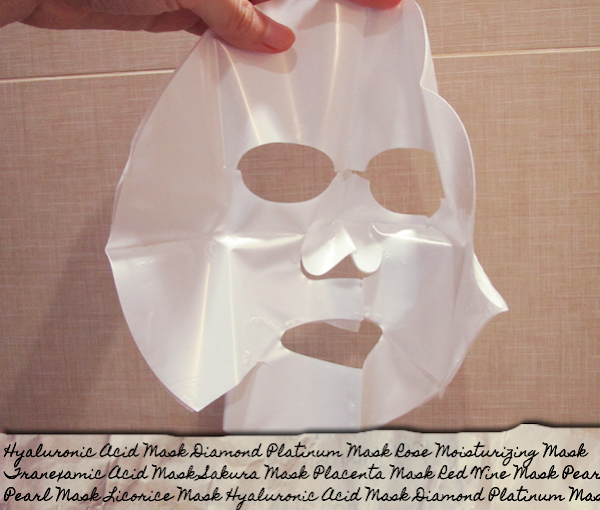 Diamond Platinum Mask: Intensive anti-aging, reduces fine lines and wrinkles. 3. Rose Moisturizing Mask: Intensive moisturizing and brightening of dull skin. 4. Tranexamic Acid Mask: Intensive whitening, evens skin tone and lightens spots. 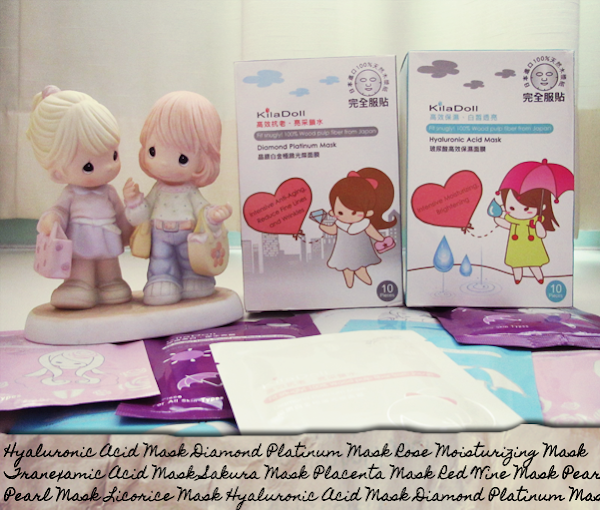 I was sent the 4 popular ones; Hyaluronic Acid Mask, Diamond Platinum Mask, Rose Moisturizing Mask and Tranexamic Acid Mask. 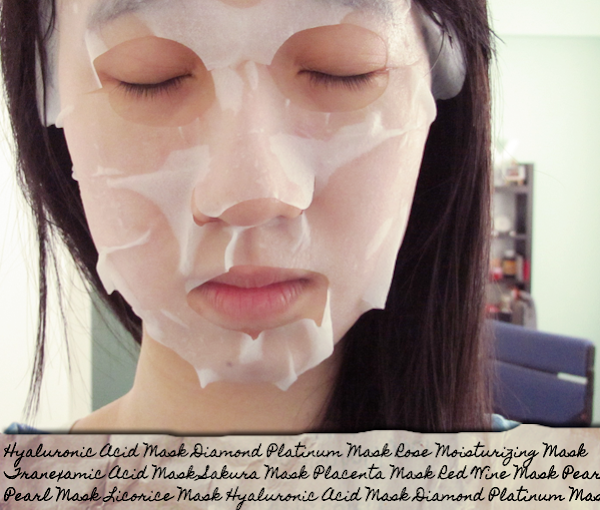 The soft cottony-like mask comes folded with a plastic in each piece. The mask is steeped in essence, so do hold it over the sink when removing the plastic. I like that the mask does not come with flaps for the eyes and mouth as I find those troublesome. I know some people use them over their eyes and lips but I can't, for the life of me, just lie down and do nothing for 20 minutes. So thumbs up for the mask! 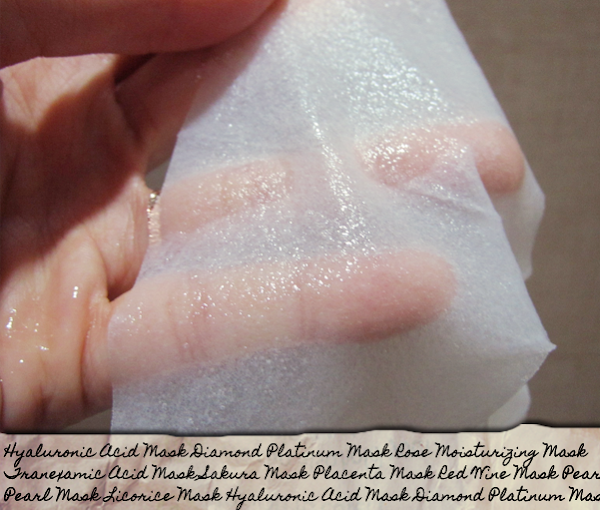 The mask is cottony-soft and feels super comfortable on the skin! And there is an even bigger oomph when the mask is refrigerated before application! My skin just wants to eat it! However, as you can see above, the mask is quite huge! It covers my hairline and I don't quite like it when my hair drips with essence. :\ But aye, it ensures that every inch of your face is covered. It also adheres to my skin the entire time, even when I'm sitting straight up. A light, pleasant scent accompanies each mask but it doesn't linger for long. As aforementioned, all 4 masks are soaked in essence. There is enough to not just cover your face, but your neck, arms and legs as well (Wipe your arms and legs with the mask once you are done with your masking session!). I haven't noticed any brightening or whitening of my skin (There is no immediate brightening effect.) but I supposed these will come in the long run. After 20 minutes, my skin is left adequately moisturized. All products are sponsored by Beaute Inn Pte Ltd.